For Gallia or Gaul before the Roman conquest, see Gaul. The Roman Republic began its takeover of Celtic Gaul in 121 BC, when it conquered and annexed the southern reaches of the area. Julius Caesar completed the task by defeating the Celtic tribes in the Gallic Wars of 58-51 BC. In 22 BC, imperial administration of Gaul was reorganized, establishing the provinces of Gallia Aquitania, Gallia Belgica and Gallia Lugdunensis. Parts of western Gaul were incorporated into Raetia (15 BC) and Germania Superior (AD 83). During Late Antiquity, Gaulish and Roman culture amalgamated into a hybrid Gallo-Roman culture. The Gaulish language was marginalized and eventually extinct, being replaced by regional forms of Late Latin which in the medieval period developed into the group of Gallo-Romance languages (including French and Occitan). Roman control over the provinces deteriorated in the 4th and 5th centuries, and was eventually lost to the kingdoms of the Franks, Visigoths and Burgundians. The last vestiges of any Roman control over parts of Gaul were effaced with the defeat of Syagrius at the Battle of Soissons (AD 486). Map of Roman Gaul by Gustav Droysen (1886). Gallia Cisalpina or "Gaul this side of the Alps", covered most of present-day northern Italy. Gallia Narbonensis, formerly Gallia Transalpina or "Gaul across the Alps" was originally conquered and annexed in 121 BC in an attempt to solidify communications between Rome and the Iberian peninsula. It comprised the present-day region of Provence-Alpes-Côte d'Azur, most of Languedoc-Roussillon, and roughly the southeastern half of Rhône-Alpes. The Romans divided these huge provinces into civitates corresponding more or less with the pre-Conquest communities or polities sometimes described misleadingly as "tribes," such as the Aedui, Allobroges, Bellovaci, and Sequani (see List of Celtic tribes) but the civitates were too large and in turn were divided into smaller units, pagi, a term that eventually became the modern French word "pays". These administrative groupings would be taken over by the Romans in their system of local control, and these civitates would also be the basis of France's eventual division into ecclesiastical bishoprics and dioceses, which would remain in place—with slight changes—until the French revolution. Northern Gaul "sou", 440-450, 4240mg. In the five centuries between Caesar's conquest and the collapse of the Western Roman Empire, the Gaulish language and cultural identity underwent a syncretism with the Roman culture of the new governing class, and evolved into a hybrid Gallo-Roman culture that eventually permeated all levels of society. Gauls continued writing some inscriptions in the Gaulish language, but switched from the Greek alphabet to the Latin alphabet during the Roman period. 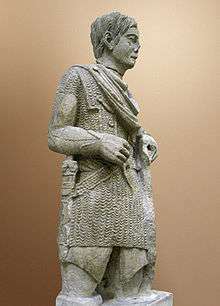 Current historical research suggests that Roman Gaul was "Roman" only in certain (albeit major) social contexts, the prominence of which in material culture has hindered a better historical understanding of the permanence of many Celtic elements. The Roman influence was most apparent in the areas of civic religion and administration. The Druidic religion was suppressed by Emperor Claudius I, and in later centuries Christianity was introduced. The prohibition of Druids and the syncretic nature of the Roman religion led to disappearance of the Celtic religion. It remains to this day poorly understood: current knowledge of the Celtic religion is based on archeology and via literary sources from several isolated areas such as Ireland and Wales. The Romans easily imposed their administrative, economic, artistic (especially in terms of monumental art and architecture) and literary culture. They wore the Roman tunic instead of their traditional clothing. The Romano-Gauls generally lived in the vici, small villages similar to those in Italy, or in villae, for the richest. Surviving Celtic influences also infiltrated back into the Roman Imperial culture in the 3rd century. For example, the Gaulish tunic—which gave Emperor Caracalla his surname—had not been replaced by Roman fashion. Similarly, certain Gaulish artisan techniques, such as the barrel (more durable than the Roman amphora) and chain mail were adopted by the Romans. The Celtic heritage also continued in the spoken language (see History of French). Gaulish spelling and pronunciation of Latin are apparent in several 5th century poets and transcribers of popular farces. The last pockets of Gaulish speakers appear to have lingered until the 6th or 7th century. Germanic placenames were first attested in border areas settled by Germanic colonizers (with Roman approval). From the 4th to 5th centuries, the Franks settled in northern France and Belgium, the Alemanni in Alsace and Switzerland, and the Burgundians in Savoie. The Roman administration finally collapsed as remaining Roman troops withdrew southeast to protect Italy. Between 455 and 476 the Visigoths, the Burgundians, and the Franks assumed control in Gaul. However, certain aspects of the ancient Celtic culture continued after the fall of Roman administration and the Domain of Soissons, a remnant of the Empire, survived from 457 to 486. In 486 the Franks defeated the last Roman authority in Gaul at the Battle of Soissons. 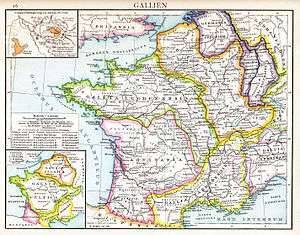 Almost immediately afterwards, most of Gaul came under the rule of the Merovingians, the first kings of a proto-France. Certain Gallo-Roman aristocratic families continued to exert power in episcopal cities (as in the cases of the Mauronitus family in Marseilles and of Bishop Gregory of Tours). The appearance of Germanic given- and family-names becomes noticeable in Gallia/Francia from the middle of the 7th century on, most notably in powerful families, thus indicating that the centre of gravity had definitely shifted. The Gallo-Roman (or Vulgar Latin) dialect of the late Roman period evolved into the dialects of the Oïl languages and Old French in the north, and into Occitan in the south. The name Gallia and its equivalents continued in use, at least in writing, until the end of the Merovingian period in the 750s. 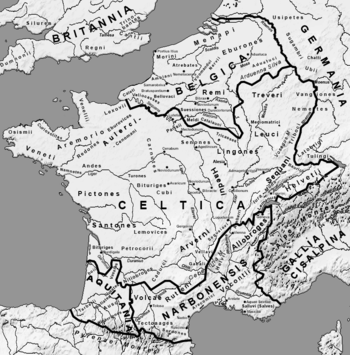 Slowly, during the ensuing Carolingian period (751-987), the expression Francia, then Francia occidentalis spread to describe the political reality of the kingdom of the Franks (regnum francorum). ↑ The territory of Gaul roughly corresponds to modern-day France, Belgium and Luxembourg, and adjacient parts of the Netherlands, Switzerland and Germany. Portions of this article are based on a translation of the article Gaule from the French Wikipedia on February 2007.